Sign up for Broadjam today to follow Gary Lee Ireland, and be notified when they upload new stuff or update their news! 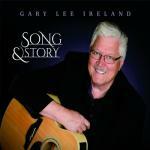 The album is a collection of Gary's songs that give testimony to his journey to Jesus Christ. The songs on the Album are typically performed during Gary's Song & Story ministry: Jesus Can We Talk? All The Way To Heaven It's All About Love Joyce's Song Hear My Prayer Where's Grandma? What Can I Do? Show Me HIs Hands (Thomas' Song) A Little More Time Winter Winds To purchase and download individual songs or the entire album, click on BUY.